September 30, 2013 By This post may contain affiliate links. The best part of Halloween is everything gets to be spooky and gory! 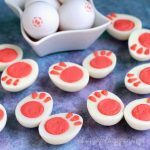 These Gross Halloween Food and Recipes were so much fun to make and fun to see people cringe at! What do you think of the images above? Some are pretty dreadful, right? Halloween is the perfect time to share the good, the bad, and the ugly. Usually when one of my recipes is a flop, I hide the evidence. The food ends up the in trash and the photos are stashed under my proverbial bed, along with all things scary or bad. Who really wants to share their failures? I know I’m a perfectionist, especially when it comes to my edible crafts. So, when I had yet another failed recipe yesterday, I wanted to toss it away, to forget about it. But, honestly I thought the concept was great. The execution failed, and I could have done it over again, as I usually do. But after baking all week, I just didn’t have it in me to make another 24 cupcakes to do it all over again. So, here it is, my cupcake witch hand. It isn’t frighteningly bad, just not great. It’s very simple project, that should have turned out fine. 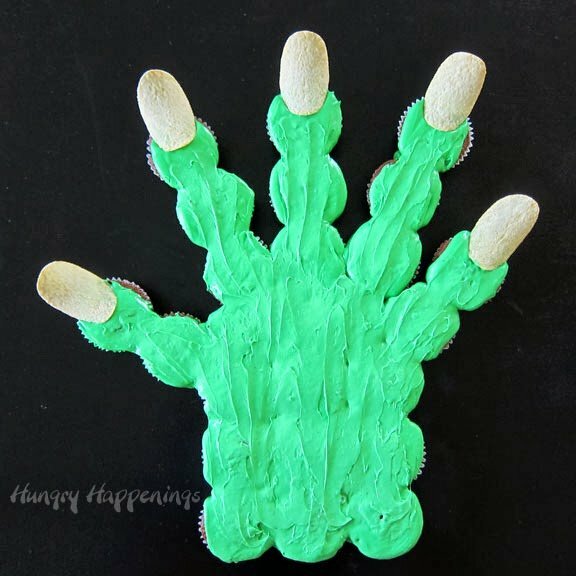 I arranged 24 cupcakes into a hand shape. I tinted my frosting green, which was my downfall. By the time it got to the right shade of witch hand green, it was thin. I piped it over the cupcakes, and it dribbled down the sides of the paper liners, leaving a green sticky mess. After a little clean up and re-arrangement of the thumb, I added some Pringles finger nails. In the end, it does kind of resemble a witch’s hand, but I didn’t feel it was worthy of it’s own tutorial. Neither did any of these other Halloween failures. 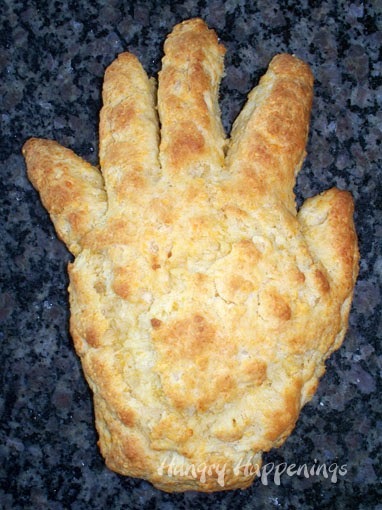 Years ago, I created my first Feet Loaf out of turkey for our Dead Man’s Diner Party. As you can see, my picture is terrible and the color of the meatloaf is really putrid. Eww! I made this pizza to go into my cookbook, Hungry Halloween featuring Movie Monster Munchies, Bewitched Buffet, and Dead Man’s Diner. I thought it was a hot mess, but I did eventually rework it and put a much better version in my book. 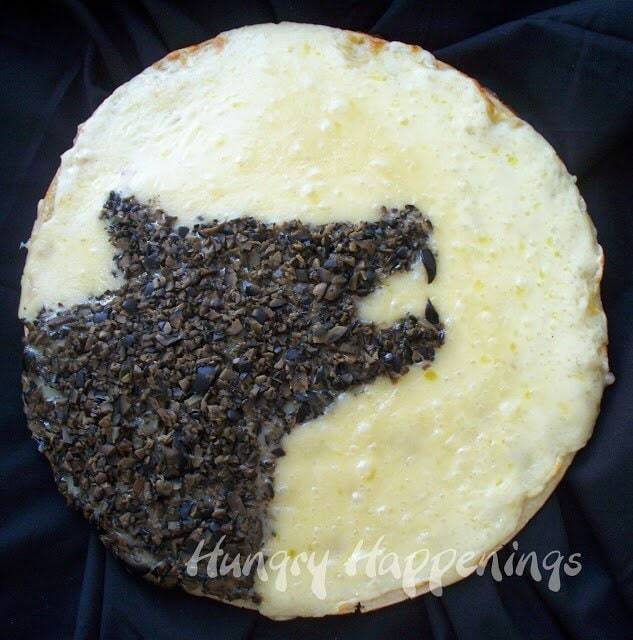 This wolf is misshapen and the pizza looks so greasy. Have you ever tried to photograph pizza? It is a nightmare, seriously. See what I mean. Gross, looking, right. This pizza is topped with green pesto, shredded cheese, and decorated cheese slices. 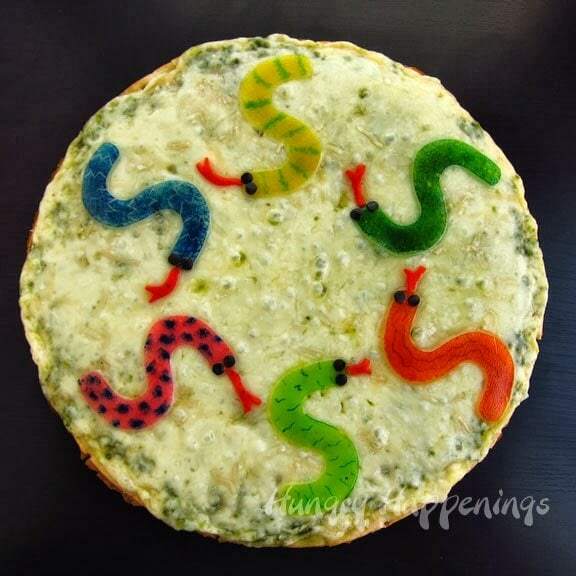 Although I liked the look of the simple “S” shaped snakes, the pizza just looked awful. When taking pictures of pizza, somehow you need to keep the cheese hot. I know the professionals use heat lamps and even high heat blow dryers to keep the cheese melted. They also make dozens of pizza pies for one single photo shoot. I only had one pizza and no way to keep it hot, so my picture of these snakes slithering across my pizza was not appetizing at all. 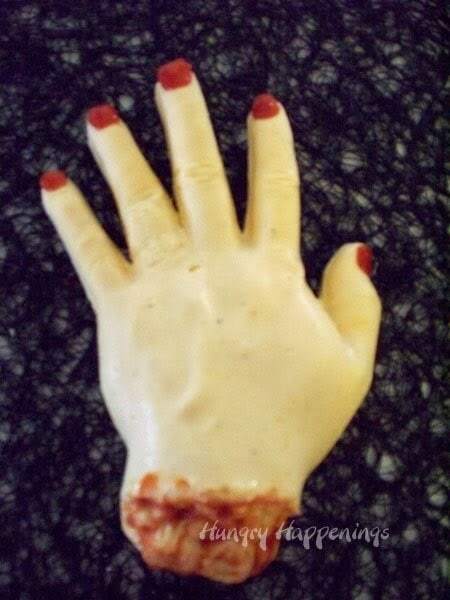 This bloody severed hand cheese ball, was actually really cool, in person, but four years ago when I created it, my photography skills were really lacking, obviously. I tried my hand at making creepy bread for our Dead Man’s Diner party. It didn’t look like I’d hoped, so I cut it into chunks and used it to dip into fondue for dinner one night. 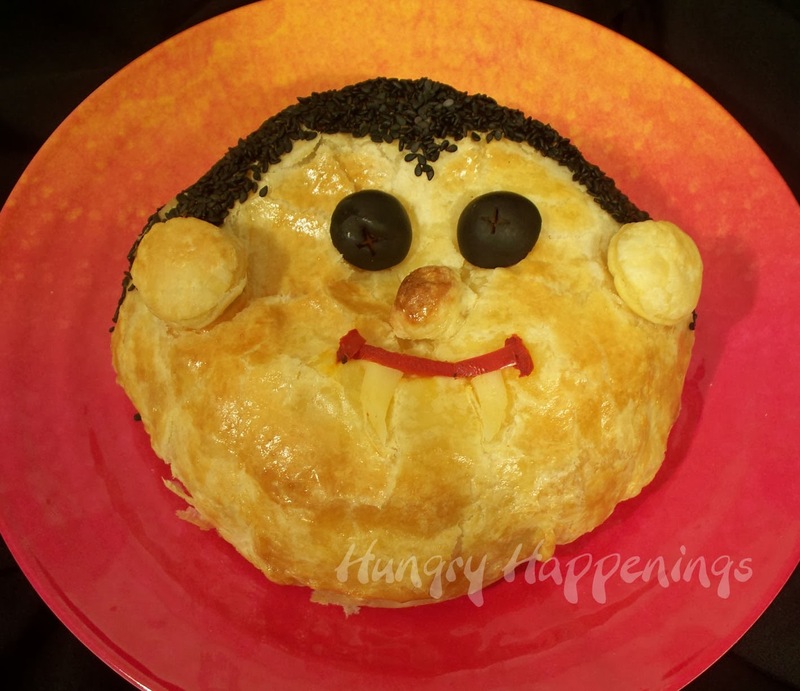 My monster pies had great potential, but looked childish, at best. If I would have reworked them, they could have been served at our Monster Movie Party. I might just need to revisit this idea. It’s not bad at all. 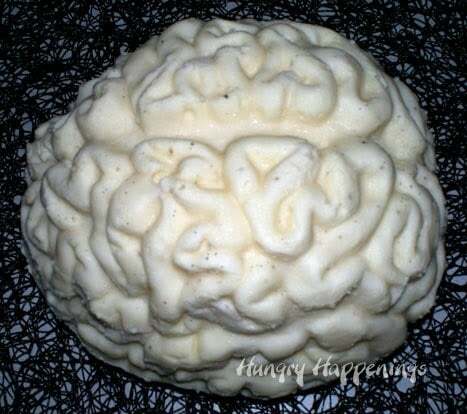 You may think, that this brain looks pretty good. I agree, it does. But it’s made of cold mashed potatoes and once they got heated up, they were a melted mess. It still would have been a fun addition to our zombie themed party last year, but they just didn’t fit into our menu. This silly Dracula was my first, failed, attempt at making a decorated Brie en Croute (Brie cheese baked in puff pastry.) 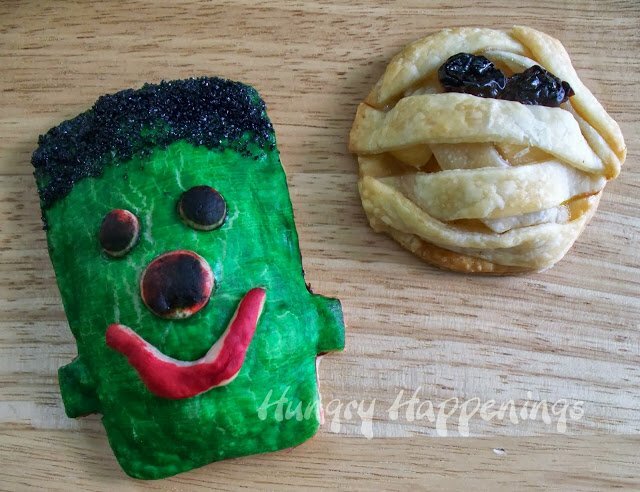 I did fix it, and a wonderful version of it is in my cookbook, Hungry Halloween. It still makes me laugh to look at this guy with his big bulbous ears, creepy eyes, and crooked smile. What can I say about these peanut butter and jelly bloodshot eyes. They don’t look much like eyes at all, but perhaps another female body part. Just not right. These are even worse. I can’t even believe I took pictures of them. 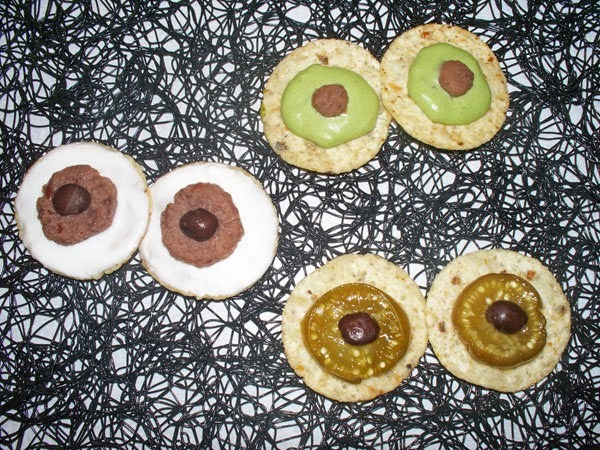 I had made some really cool snacks for the appet-eye-ser display at our party, but these certainly weren’t part of it. Before you continue, the next picture is really gross. Stop, don’t look, if you are squeamish. Nasty, right? I was going for skin and blood, and think I nailed it! But, who in their right mind would eat it or serve it? Not even me. It was too gruesome even for our Dead Man’s Diner Party. 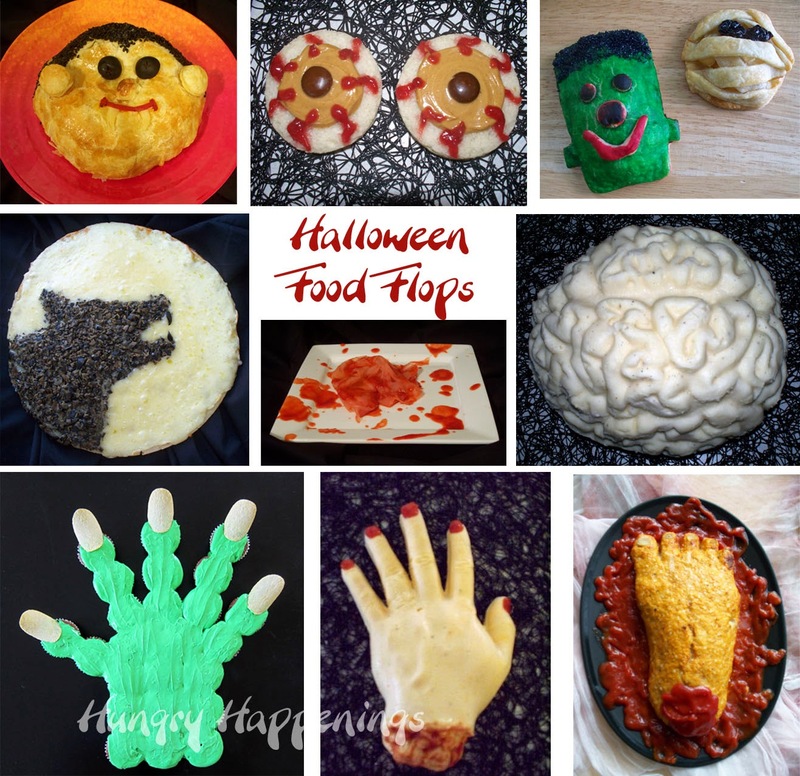 So there you have it, all of my Halloween food flops in one place to gawk at and ridicule. Don’t worry, you wont hurt my feelings. They are bad, and I know it. Back in 2010, I did compile some of my best Halloween recipes into my cookbook, Hungry Halloween. Mind you, my photography skills and presentation have come a long way since then, but the recipes really are great. If you’d like a copy, you can buy one from amazon.com and they are even on sale right now, so you’ll get a nice bargain. 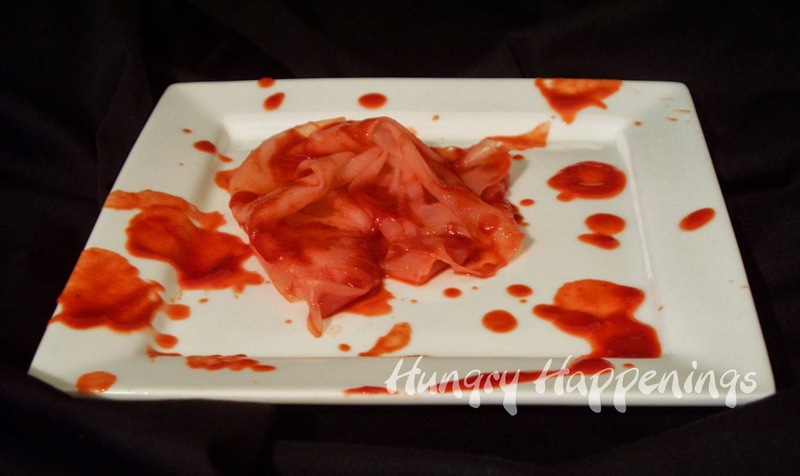 Well the skin and blood in this image is actually rice spring roll wrappers dipped in spaghetti sauce. I put the sauce through a strainer to remove all the chunks of tomato and spices (like oregano and basil) so the blood would just be bright red. When heated up this dish tastes like spaghetti. You could also use really thin pieces of ham or bologna for this. 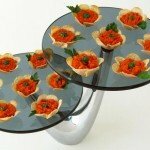 I love that you would serve this. I really wanted to add this idea to my book, but everyone I showed this too, was really grossed out and recommended I skip it! The skin and blood dish looks awesome!! I am totally bookmarking this page for that one. I'm so geeked out that you are the second person to comment positively about the skin and blood. Maybe it should have landed in the pages of Hungry Halloween after all. I'm so glad you posted your mistakes because I was starting to think you're perfect 🙂 ! (I'm a big fan-geek.) 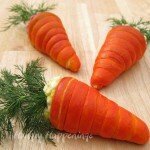 I love all your stuff but I think that Halloween food craft is THE BEST. You have so many great ideas in your book (which I own!! ), I need to go pull it out and start planning. I live in Northern NJ so Two Halloweens In a Row have been ruined by hurricanes (talk about BOOOO!!!). So this year is gonna be BIG!! Love ya, keep up the GREAT work. Perfection can be faked on-line!!! Believe me, I have lots of flops, most of which never get photographed. Some days in the kitchen are total failures. I much prefer when things go well and I too love Halloween. I'm so glad you like my book. 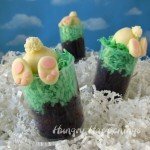 They were my first edible craft recipe creations to be published and I'm really proud of them. I know I'm a perfectionist! I did take pictures of these flops, as I thought they weren't too bad. The worst never see the camera lens and end up in the trash:) I love the cheese hand. It went over really well at our party. Thanks, Brenda. I know I am hard on myself:) Some days it drives me crazy. 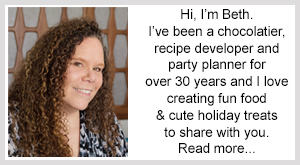 Beth – so glad you posted these – I know you are a sweet girl and perfectly human……but sometimes it appears you are perfect! Whew! P.S. – the blood/skin thing creeps me out too but I think you are supposed to be, right? Nope, perfectly human, that's for sure, with warts and all. When I made the skin and blood thing, I was really going for the creep out factor and it definitely worked. I just typed a comment and accidentally clicked and it was gone, maybe because it's a Halloween post! I think the failures you talk about are not failures at all – they would be perfect for any Halloween party. And the skin and blood – so gory it's perfect! A ghost must be haunting your computer:) I really wanted to include the skin and blood in my book, but everyone I showed it to suggested I don't. I'm so happy to see so many people think it's a cool Halloween idea. Thanks! HA! I loved the gross look of some of your pictures, it's Halloween! Stuff is suppose to look gross. 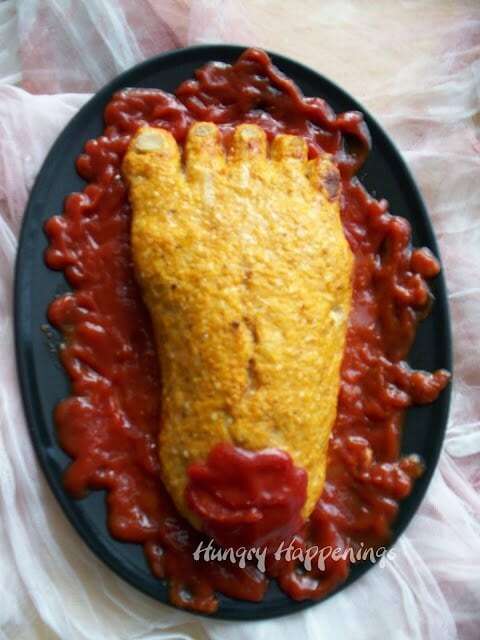 That meat loaf foot, fabulously gross looking. Your failures are great and it gives the rest of us hope 🙂 We too can become food diva's with enough practice. Thanks, Tiffany. When we hosted our Dead Man's Diner party I had a blast creating super gross Halloween food. Some of our party guests thought it was hilarious, others wanted to puke! No one actually did, but it was sure fun to make people squirm a bit. That's nice to hear. Most of these pictures have been hiding on my computer for several years. 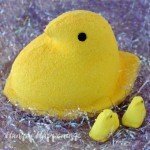 I'm glad I published them and am happy with the reactions! 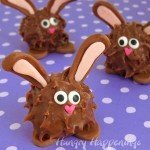 Really fun ideas! I really do like the wolf pizza, and the green hand cupcake cake is really cute! Seeing how many people here like the skin and blood, I do regret leaving it out of the book! I'm glad you like it. haha I love the “eyes”. Yes they do look like something else. Maybe if you use cream cheese instead of peanut butter?